A case of the corpus callosum and alien hand syndrome from a discrete paracallosal lesion Raymond Faber a b c , Alvi Azad c d & Richard Reinsvold d a Laurel Ridge Treatment Center , San Antonio, TX, USA b South Texas Veterans Health Care System , San Antonio, TX, USA c University of Texas Health Science Center at San Antonio , TX, USA d Wilford Hall Medical Center, Lackland Air Force Base , San Antonio, TX, USA Published online: 11 Jan 2010. Taylor & Francis makes every effort to ensure the accuracy of all the information (the “Content”) contained in the publications on our platform. However, Taylor & Francis, our agents, and our licensors make no representations or warranties whatsoever as to the accuracy, completeness, or suitability for any purpose of the Content. Any opinions and views expressed in this publication are the opinions and views of the authors, and are not the views of or endorsed by Taylor & Francis. The accuracy of the Content should not be relied upon and should be independently verified with primary sources of information. Taylor and Francis shall not be liable for any losses, actions, claims, proceedings, demands, costs, expenses, damages, and other liabilities whatsoever or howsoever caused arising directly or indirectly in connection with, in relation to or arising out of the use of the Content. Here we present a patient with an isolated paracallosal brain lesion who exhibited behavioral changes associated with the corpus callosum syndrome (CCS) including features of the alien hand syndrome (AHS). The CCS is also known as the split-brain syndrome, the syndrome of hemisphere disconnection, the syndrome of brain bisection and the syndrome of the cerebral commissures. Because most reported cases of CCS were caused by tumors which extended beyond the corpus callosum (CC) and did not always induce a complete disconnection, there was much controversy about the role of the CC and the existence of a specific CCS. Aside from surgically based cases, the full complement of the CCS is infrequently clinically encountered. The patient described has a classic CCS from natural causes. This case report is unique in exhibiting a complete CCS with AHS secondary to an ischemic event affecting the left pericallosal region. To our knowledge this is the first case report of such a combination. Keywords: Split-brain syndrome; Syndrome of hemisphere disconnection; Paracallosal lesion; Apraxia; Agraphia. Address correspondence to Raymond Faber, MD, 7400 Merton Minter Blvd. 116-A, San Antonio, TX, 78229, USA. (E-mail: faber@uthscsa.edu). postures, right hand constructional apraxia, inter- manual conflict, and anarchic (alien) hand syn- drome. P.P. was a 56-year-old Caucasian man referred by the Occupational Therapy service of a Veterans Affairs medical center because of his lack of progress in improving his ability to perform bimanual activities in spite of good exercise capability, no focal gross motor or sensory defi- cits, and intact comprehension. His past medical history was significant for hypertension, atrial fibrillation, retinitis pigmentosa (legally blind in his right eye), Peyronie’s disease, Barrett’s esophagus, colonic polyps, peripheral vascular disease (status post graft placement), and cerebral vascular disease. His substance use history was significant for 60+ pack years of smoking, and occasional alcohol use. He had no history of psychiatric illness. impaired bimanual coordination, for example tying his shoes, buttoning his shirt, eating and driving his car. His right hand would remove a utensil from his mouth, so he had to use his left hand to keep utensils in place. He reported after placing a car key in the ignition, his right hand would remove it, and his left hand would counter by replacing it. His wife said unwanted actions of right hand would be less prominent if she ‘made a joke of it around him’. He also had difficulties turning over in bed, coughing, and blowing his nose. The patient was always quite cooperative. He never faltered in attempting to perform all tasks asked of him. He smiled broadly and made good eye contact. He was, in fact, quite engaging. He responded with pertinent answers and was apol- ogetic when he could not answer or perform correctly. He was never circumstantial or tan- gential in his speech. He maintained a consistent, stable euthymic mood without any trace of depression, anxiety, or dysphoria. He had excel- lent long-term memory in discussing his medical problems, family relationships, employment history, and recreational interests. He denied experiencing psychotic symptoms. He denied having obsessions or compulsions. He denied any thoughts of harming himself or others. He had fair but limited insight into his difficulties. In acknowledging and apologizing for social miscues, he displayed fair insight and good judgment. He freely discussed instances of having inter- manual conflict. This included aforementioned difficulties with tying his shoes, using utensils, and keeping the car keys in the ignition. At times when asked to place a piece of paper in an enve- lope, he would correctly fold the paper and insert it but then almost immediately remove it. He admitted this removal was at odds with his conscious intentions. At a prior recent hospitali- zation, he was reprimanded on several occasions when his right hand reached out and grabbed the derriere of nearby female nurses. When confronted with this, he blushed and acknowl- edged doing this repeatedly but insisted he had absolutely no intention of acting in this manner. He expressed regret and empathy for the women he had offended. In systematic testing with his vision blocked, he could not name any object placed in his left hand. Though he could grasp, balance and manipulate what was placed in his left hand, he often said there was nothing in it when asked to name the object. Without being aware of the object he was unable to draw or write the name of the object. When the same object was placed in his right hand, he would immediately name it correctly. After having different objects placed into his right or his left hand, he consistently pointed to the correct object from an array of multiple choices when using the same hand in which the object had been placed, in spite of not being aware of the object when it was placed in his left hand. However, when he was asked to point to the object placed in his contralateral hand, right or left, he would say ‘I don’t know’ or none in the array had been in his hand. With his right hand, he was very adept in demonstrat- ing how to use or manipulate a wide array of objects or do things like salute, wave goodbye, hitchhike, throw a kiss, and make the sign of the cross. With his left hand, he could not perform any of these gestures. He would move his left hand, raise it, and at best make an approximate attempt such as rubbing his forehead when asked to touch his left ear. Similarly, with his vision blocked, he could not replicate with either hand the position of one hand with some fingers extended and some folded. His handwriting with his left hand was far worse than expected of a right-hander. Copies of drawings using his right hand were judged to be poor, though no worse than those done with his left hand. genu towards the splenium of the CC. This was interpreted as an infarct affecting the left perical- losal artery or possibly a watershed infarct in the same region. Figure 1. Sagital T1 image showing lucency superior to anterior portion to left edge of CC. Figure 2. Sagital T1 image showing lucency slightly lateral to Figure 1 to the left of the central portion of the CC. Figure 3. Coronal T1 showing lucency extending superior from enlarged left ventricle along side of the CC. callosal syndromes with left ideomotor apraxia, constructional apraxia, and left-hand agraphia. Two patients had alien hand phenomena (Giroud & Dumas, 1995). A series of 100 consecutive anterior cerebral artery infarctions found no exam- ples of the callosal syndrome in spite of frequent involvement of the corpus callosum (Kang & Kim, 2008). Two cases of classic AHS with intermanual conflict but without other signs of the CCS were reported secondary to infarction of the pericallosal artery (Suwanwela & Leelacheavasit, 2002). A case of classic CCS but without AHS was reported secondary to a left periventricular lesion adjacent to the posterior half of the corpus callosum and partially destroying the splenium (Habib, Ceccaldi, & Poncet, 1990). Our patient may be the first reported with complete CCS and AHS from natural causes. The term AHS has a complex history and has recently taken on a variety of definitions in the lit- erature. We define it as a phenomenon of purpose- ful but unintentional activity of an arm at odds with what the patient wishes the arm to do. The subject may disavow this activity, which sometimes acts at cross-purposes with the other arm. The term ‘anarchic’ hand syndrome better fits our patient as he did not deny ownership of his hand while experiencing his alien hand symptoms (Della Sala, Marchetti, & Spinnler, 1991). At times he also clearly displayed ‘intermanual conflict’. Figure 4. Similar but more anterior to Figure 3. Figure 5. Axial T1 showing left paracallosal lucency. Figure 6. Axial T2 showing left paracallosal lesion. limited to the middle and posterior portions of the body of the corpus callosum (Geschwind et al., 1995), partial status epilepticus (Feinberg, Roane, & Cohen, 1998), cortical-basal degeneration (Riley, 1990), and toxoplasmosis (Caixeta et al., 2007). We believe the case reported is unique in exhibiting a complete CCS with AHS secondary to an ischemic event affecting the left pericallosal region. To our knowledge this is the first case report of such a combination. Akelaitis, A. J. (1945). 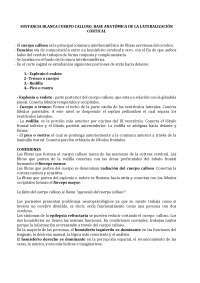 Studies on the corpus callosum IV: Diagnostic dyspraxia in epileptics following partial and complete section of the corpus callosum. American Journal of Psychiatry,101, 594–599. Bogen, J. E. (1979). 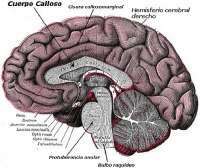 The callosal syndrome. In K. M. Heilman & E. Valenstein. (Eds. ), Clinical neuropsy- chology (1st ed., pp. 308–359). New York: Oxford University Press. Brion, S., & Jedynak, C. P. (1972). Troubles du transfert interhemispherique (callosal disconnection). A propos de trios observations de tumeurs du corps calleux. Le signe de la main etrangere. Revue Neurologique (Paris),126, 257–266. 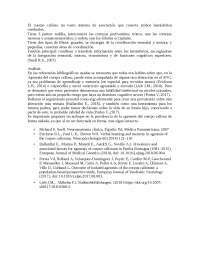 Caixeta, L., Maciel, P., Nunes, J., Nazareno, L., Araujo, L., & Borges, J. R. (2007). 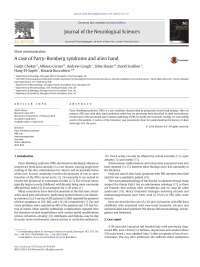 Alien hand syndrome in AIDS. Dementia & Neuropsychalgia,1(4), 418–421. Denny-Brown, D. (1956). Positive and negative aspects of cerebral cortical functions. North Carolina Medical Journal,17, 295–303. Denny-Brown, D. (1958). The nature of apraxia. Journal of Nervous and Mental Disease,126, 9–32. Feinberg, T. E., Roane, D. M., & Cohen, J. (1998). Par- tial status epilepticus associated with asomatagnosia and alien hand-like behaviors. Archives of Neurology, 55, 1574–1676. Geschwind, D. H., Jacoboni, M., Mega, M. S., Zaidel, D. W., Cloughesy, T., & Zaidel, E. (1995). 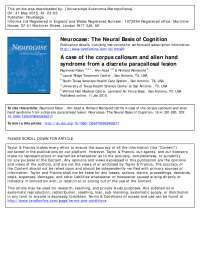 Alien hand syndrome: Interhemispheric motor disconnection due to a lesion in the midbody of the corpus callosum. Neurology,45, 802–808. Giroud, M., & Dumas, R. (1995). 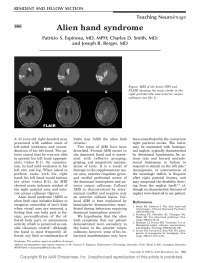 Clinical and topo- graphical range of callosal infarction: A clinical and radiological correlation study. Journal of Neurology, Neurosurgery and Psychiatry,59(3), 238–242. Habib, M., Ceccaldi, M., & Poncet, M. (1990). Callosal disconnection syndrome caused by left hemisphere infarction. Revue Neurologique (Paris),146(1), 19–24. Kang, S. Y., & Jong. K. S. (2008). Anterior cerebral artery infarction: Stroke mechanism and clinical- imaging study in 100 patients. 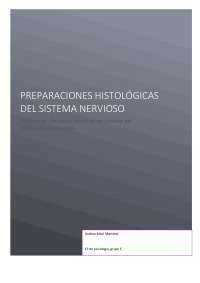 Neurology,10(70), 2386–2393. Liepmann, H. (1900). Der krankheit der apraxie, motorischen asymbolie. Monatsschr Psychiatrie und Neurologie,11, 15–44,102–132, & 182–197. Riley, D. E., Lang, A. E., Lewis, A., et al. (1990). Corti- cal-basal ganglionic degeneration. Neurology, 40, 1203–1212. Schuster, P. (1923). Zwangsgreifen und Nachgreifen, zwei posthemiplegische Bewegungstorungen. Zeitschrift fur die gesamte. Neurologie und Psychiatrre,81, 586–609. Suwanwela, N. C., & Leelacheavasit, N. (2002). Isolated corpus callosal infarction secondary to pericallosal artery disease presenting as alien hand syndrome. Journal of Neurology, Neurosurgery and Psychiatry, 72(4), 533–536. Sperry, R.W. (1961). 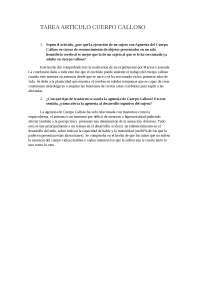 Cerebral organization and behavior. Science,133, 1749–1757. Van Vleuten, C.F. (1907) Linksseitige motorische Apraxie. Ein beitrag zur physiologie des balkens. Allgemeine Zeitschrift fur Psychiatrie,64, 203–239.